Please select a size. UK 3 - In StockUK 4 - Email me when back in stock UK 5 - Email me when back in stock UK 6 - Email me when back in stock UK 6.5 - Email me when back in stock UK 7 - Email me when back in stock UK 8 - Low Stock Please select a size. Dr. Martens Originals meet urban street wear with the Lyric collection. 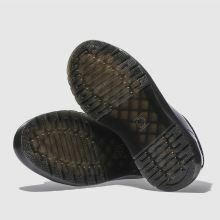 The Spin lace up shoe is an all-black design with a patent leather upper sat on a chunky AirWair outsole. A contemporary take on timeless and durable style.